Each Cream & Flutter pastry is made from scratch using only the best ingredients, including French chocolates and cocoa powders, creamy European-style butters, and pure extracts and fruit oils, as well as fresh, natural dairy products and eggs from local farms. 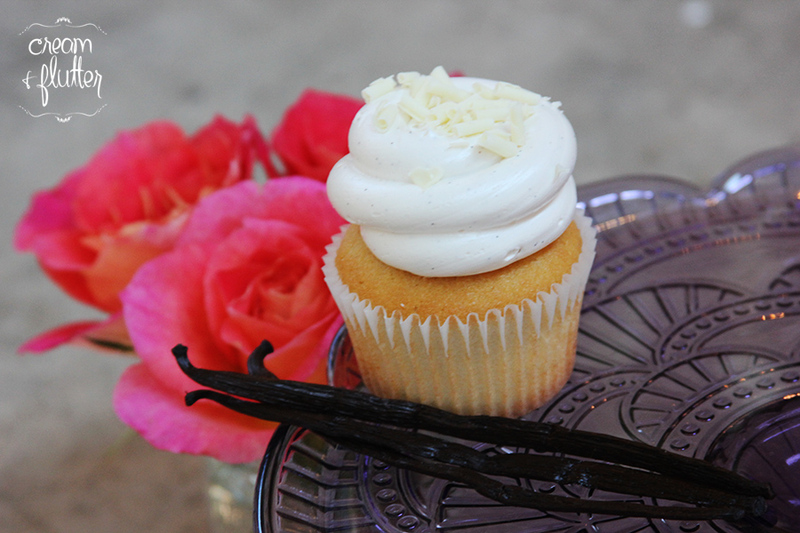 Balancing innovative, seasonal flavor combinations with approachable homespun comfort, Cream & Flutter completely redefines the standard for cupcakes. Walk in daily for signature red velvet, chocolate, and vanilla, plus two unique seasonal options, switched the first Monday of each month. We can offer gluten free cupcakes as a custom order, minimum quantity 1 dozen. Any of our cupcakes can also be ordered as minis by the dozen to cater events! Just give us a call 2-3 days before your date. 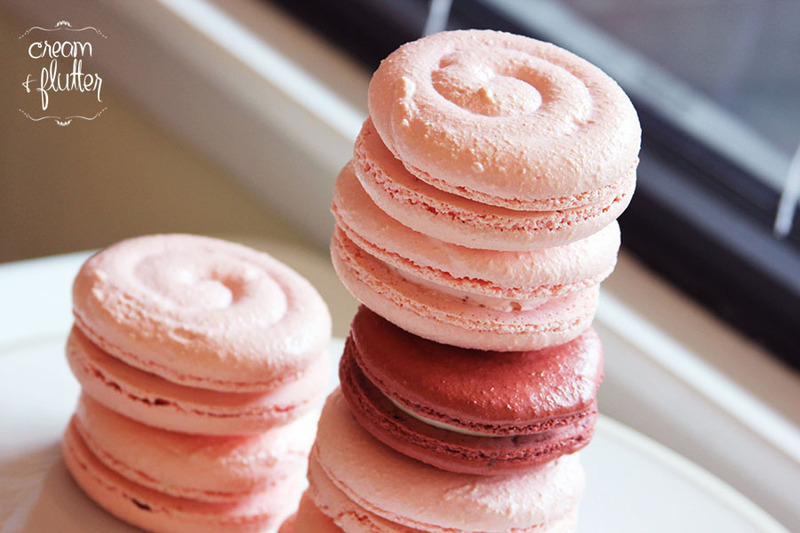 Our pinwheel French macarons are beloved for their pretty shapes and fun flavors! See our seasonal flavors table (below on this page) to check when your favorites will be available. 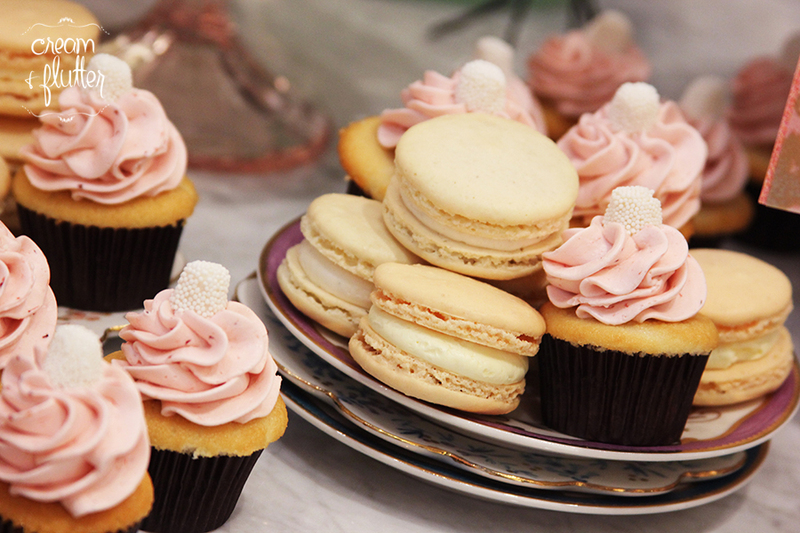 We can also make traditional smaller French macarons by the dozens as a custom order! Available as a custom order, minimum quantity 2 dozen! 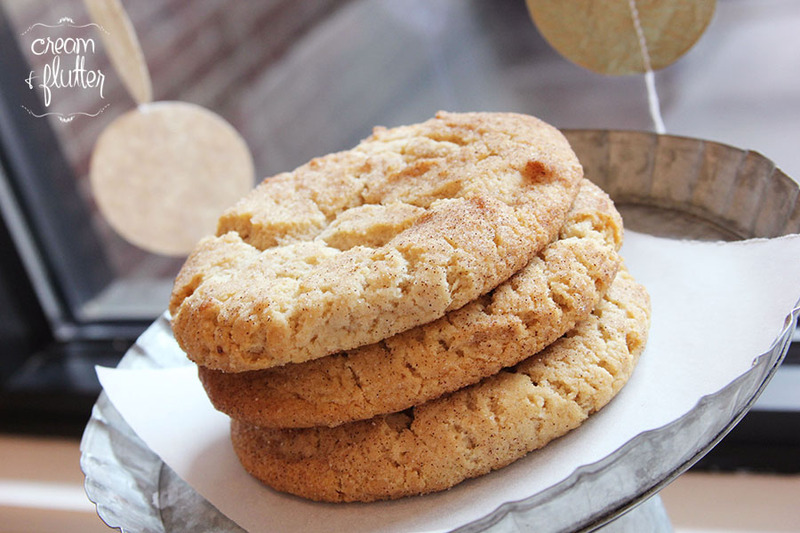 We bake huge homemade cookies fresh each morning for our customers to walk in and purchase from our display. We also make these same flavors available to order in larger quantities, or as mini cookies sold by the dozens. Mini cookies are a great way to feed a big crowd on a limited budget: order from a wide selection of flavors – we have something for everyone! Our deliciously dark chocolate brownies are generously sized -- perfect for an individual indulgence or to share with a friend! Look for special seasonal brownies in the Fall (S'mores) and around the holiday season (Dark Chocolate Peppermint). Brownies can also be made as brownie bites for party and event catering - just give us a call 2-3 days before your event! Brownies are available as bites to order, per dozen per flavor. We have an exclusive partnership with Jeni's Splendid Ice Creams! The cool, creative team at Jeni's have an important mission: they are absolutely devoted to making better ice creams and bringing people together. We love their approach are so proud to be able to share their products and their spirit with our customers! We sell Jeni's by the scoop in either a sugar cone or a cup. Our Champaign IL store offers 6 rotating flavors and our Cashiers NC location offers 4 rotating flavors. Ready to roam cups of ice cream with their own built in spoon! 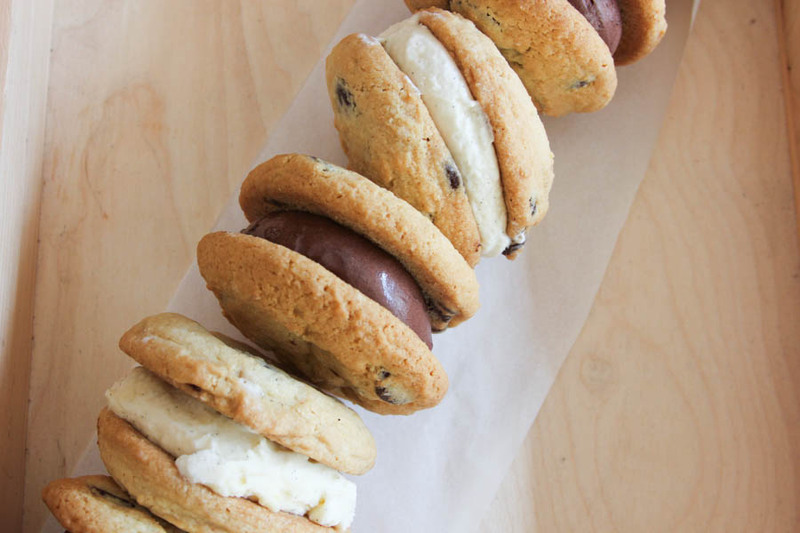 From-scratch ice cream sandwiches made to share with friends! For candy lovers of all ages! We import our colorful, unique, and delicious candies from all the way across the pond. 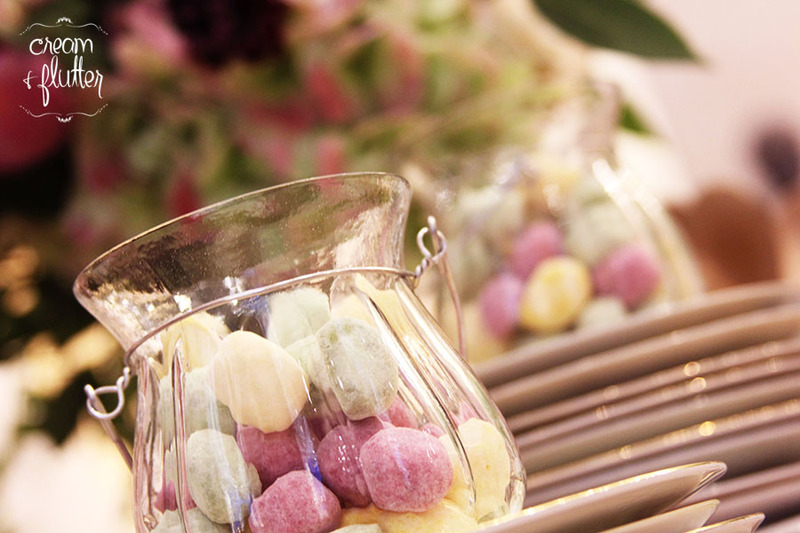 These timeless, yet trendy, British sweets make fabulous gifts and even better wedding and party favors. Buy them in bulk for candy and dessert tables! We also love our oversized, pillowy marshmallow selection and soft, chewy caramels from Little Flower Company in California. These marshmallows and caramels are delicious confections still made by hand, with care, using pure, simple ingredients! Unique sweets imported from Great Britain. Mix and match bonbons, fizzy wizzies, wine gums, and many others! 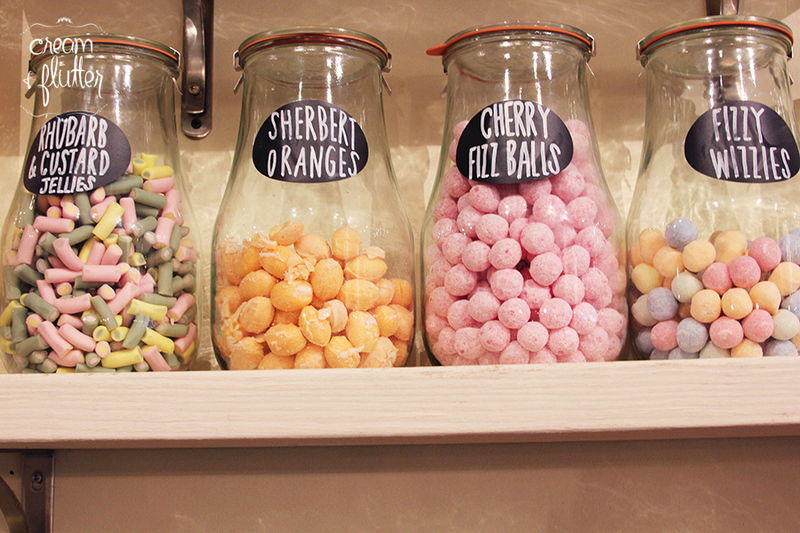 Our unique British sweets packaged in traditional style sweet jars, tied with a double-faced satin ribbon, and labeled with a hand written tag. Perfect for gifts or party favors! In addition to weddings, Cream & Flutter offers a distinctive selection of desserts for catering and other special events. We work with many individuals to host baby showers, bridal showers, and birthday parties. We also partner with many corporate clients and organizations such as local businesses, sororities, and non-profits, to help promote new products, welcome new members, or raise funds for good causes. Our goal is to make it easy for you to throw a fabulous party! All of the signature products you see available daily in our shop can be made in both single-serving and mini sizes and are easy to order in person or over the phone. We can also customize products with logos or to match party decor and are happy to produce out of season favorites with a minimum order. Delivery is available locally and we also offer stand rental in some circumstances. Dessert tables can also be a fun, interactive choice for a special event. All product is produced in bite sized proportions, making it easy for guests to enjoy dessert without forks or complicated serving requirements. And to make your life easy, we sell our fully-designed dessert tables in packages that include all of the product and services necessary to feed a specific number of guests - with absolutely no hassle on your part! If you are looking for help with products for catering or special events, please call our shop at (217) 355-5400 and speak with someone from our customer service team. They can get you started with pricing and product options! Rhubarb pies, sugar cookies, and custom cherry blossom cupcakes. Shopping at our Champaign, IL location? We have our signature flavors available every day that the shop is open, but we also make a number of fun and fresh seasonal products available as well! The schedule below will show you when to expect our seasonal products in Champaign. And don't fret if you find a seasonal favorite -- our seasonal flavors can be ordered anytime of the year. If you would like to order out of season, we simply require a minimum quantity for out of season orders. Just give us a call at (217) 355-5400 or stop by to discuss a custom order for seasonal products!